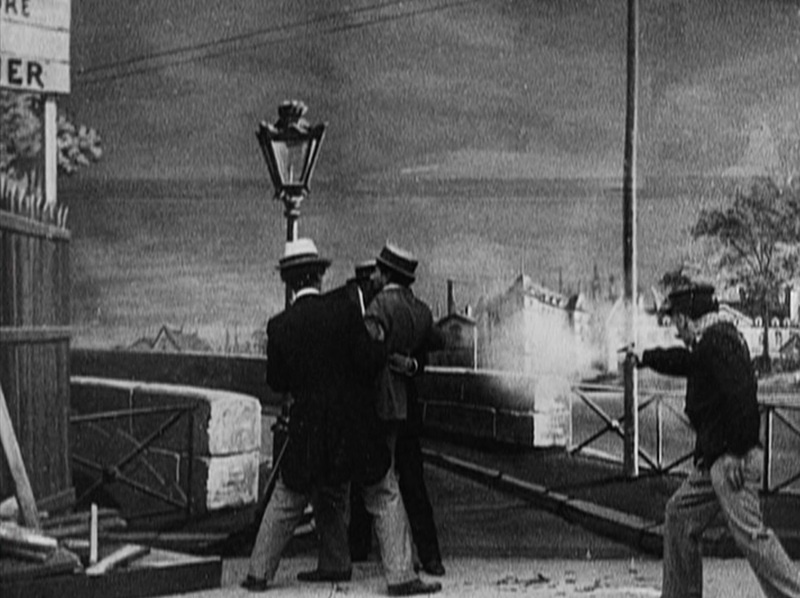 In a series of short movies, Georges Méliès depicted one of the major political events in French history while it was still ongoing, a scandal involving a Jewish man framed for espionage. This unusual set of films broke many conventions of film at the time, but set the stage for new developments and suggested ways in which cinema could be used artistically in the future. Of the original eleven films shot for this series, nine still exist. 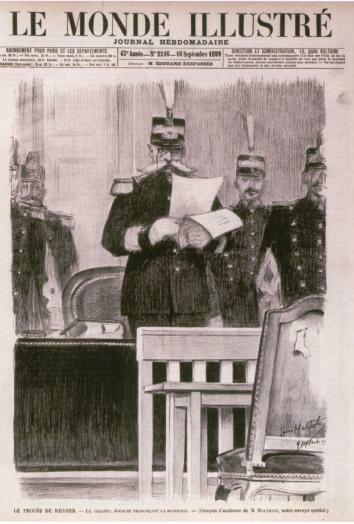 In the first, “Dreyfus Court Martial – The Arrest of Dreyfus,” we see various French officers crowded around a desk. Finally, one sits and signs a piece of paper, copying out what is dictated to him by another. The dictating man becomes agitated, and offers the other (Dreyfus) a gun, to kill himself if he is guilty, but Dreyfus refuses. The other men in the room lead him out. 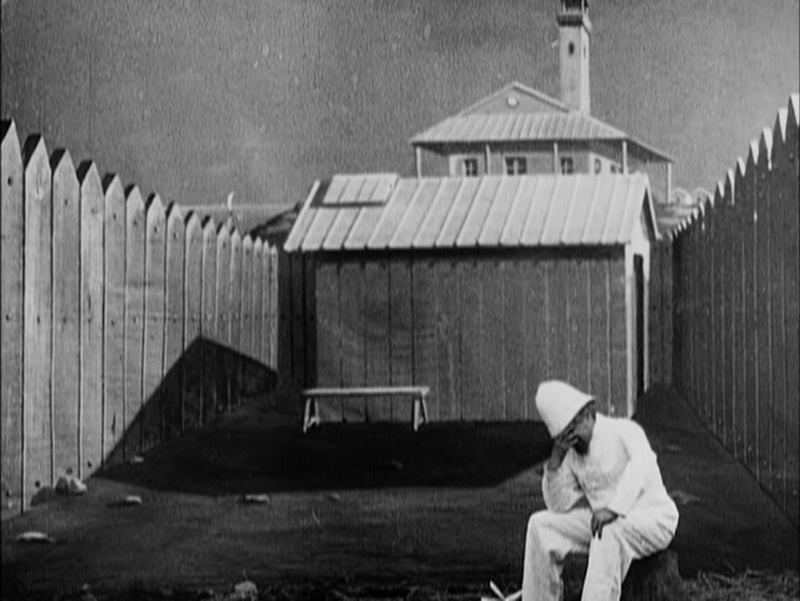 In the second surviving installment, “Devil’s Island – Within the Palisade,” we see the isolation and loneliness of the imprisoned Dreyfus (against a very obvious backdrop). A jailer delivers a letter to him and he reads in despair. The third movie is “Dreyfus Put in Irons” and it lives up to its title Dreyfus is in his bed when two jailers come in and clamp leg irons to his legs. 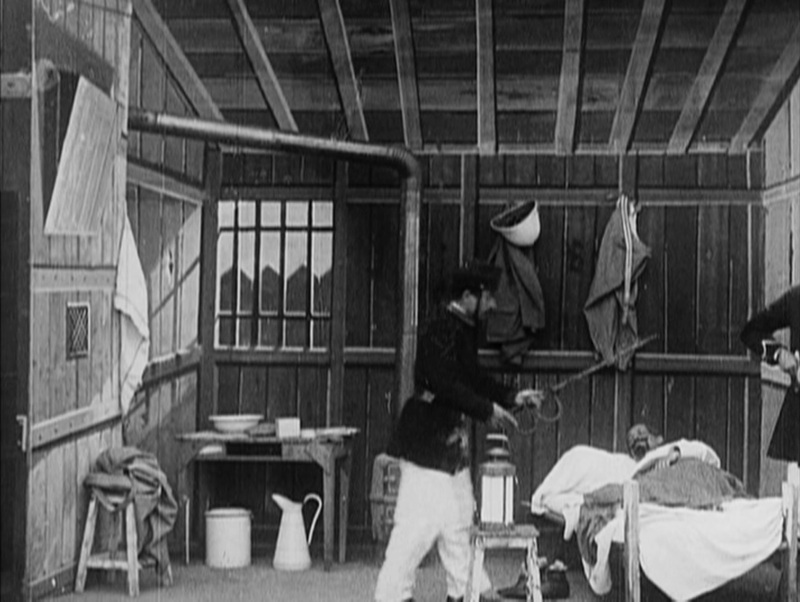 The next movie is “The Suicide of Colonel Henry.” Here, we see a different man in a cell. He writes a short note, gathers his courage, and slits his throat with a straight razor. Guards run in and find the body and the note. In the next installment, “Landing of Dreyfus at Quiberon,” Méliès indulges himself in some simple special effects. 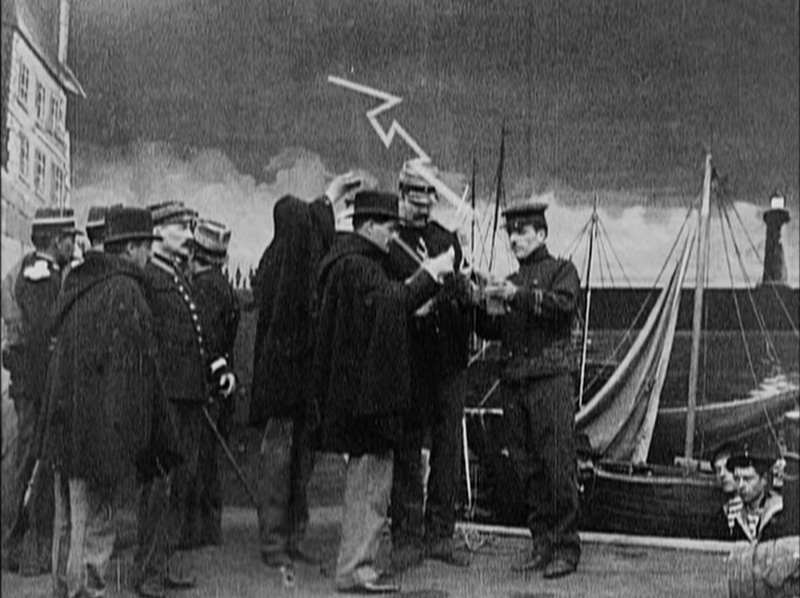 We see a stage dressed as a quay, with boats painted on the backdrop, but also the tops of two boat-props visible, which bob up and down in the “water.” There are lightning flashes (which sometimes seem to hit the actors) on the upper part of the screen, and when Dreyfus disembarks from the closer of the two boats, suddenly rain pours down on the stage. What is depicted is a simple prisoner exchange, with officers checking that all the papers are in order and then marching Dreyfus off stage. 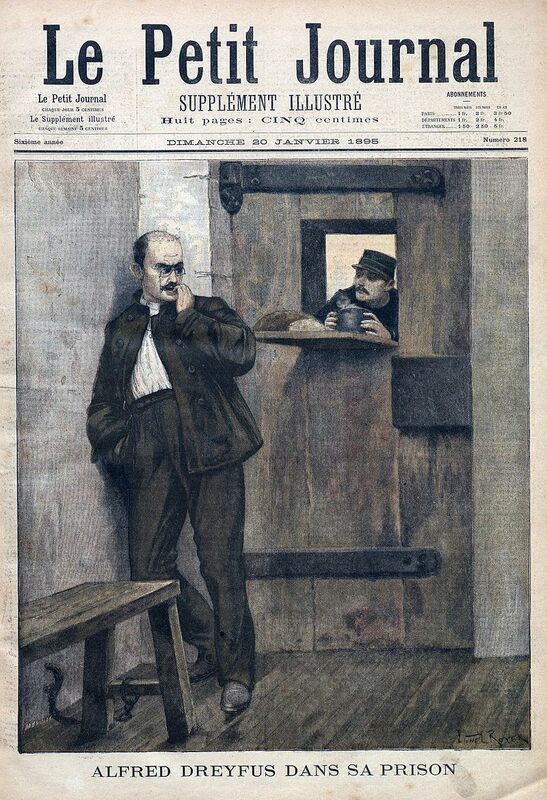 The next is “Dreyfus Meets His Wife at Rennes.” Dreyfus is in a more-comfortable-looking cell, writing at a table, and an officer directs some men to meet with him. They are suddenly interrupted by the arrival of two women. Dreyfus shows his pain at seeing his wife after so long, and the two embrace. 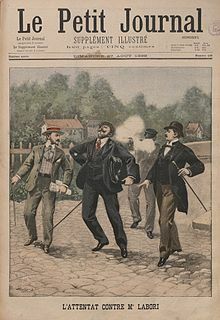 “The Attempt Against the Life of Maitre Labori” shows one of the two men from the last film (Dreyfus’s lawyers) walking in the street with his associates when a man jumps out and shoots him. He survives, but lies bleeding in the streets for a time before anyone will help him. “The Fight of Reporters” is our first true courtroom scene, shot so that the “audience” or reporters is in the foreground. All seems collegial at first, but reporters from different side of the screen seem to confront one another, someone faces the crowd and makes a speech, and chaos breaks out, then people rush toward the camera as bailiffs try to restore order. The surviving series ends with “The Court Martial at Rennes,” which frames the witness stand as the foreground, with the tribunal behind it. 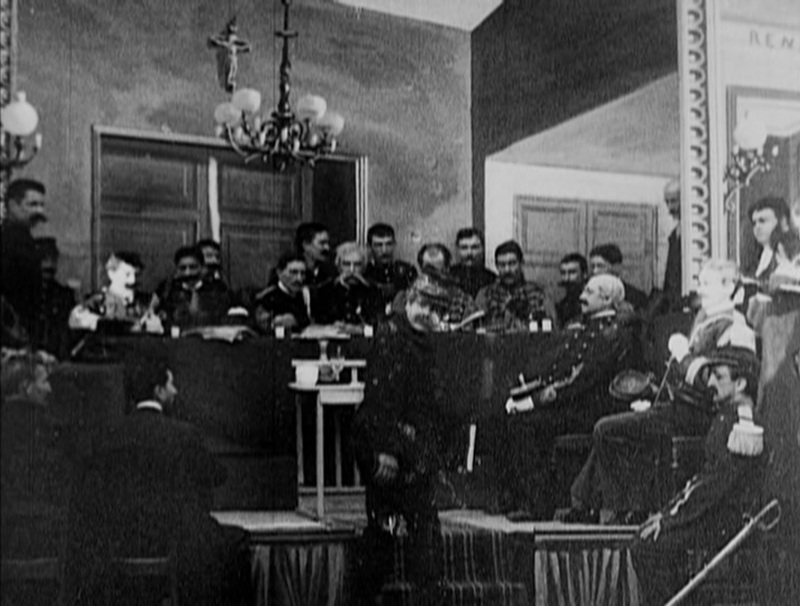 This shows the cross-examination of Dreyfus and another witness, who sit with their backs to the audience, but express themselves in body language. As the movie ends, the judges appear to be writing their findings and verdict, and the figure in the chair slumps down. At the time this series was made, a “film” was a short, one- or two-minute subject, shot from a single camera angle that played without edits from beginning to end. Audiences, however, were used to seeing several films presented one after the other, and Méliès had the idea of extending his subject over the course of several films, as a series. In a way, then, we can see this series of linked scenes as an early attempt at making a “feature,” or at least an edited narrative film. Or we can think of it as a “serial” of several linked chapters, shown in sequence. The movies were sold together, although it’s hard to say how often all of them were shown together in sequence by the exhibitors who bought them. It was also a daring comment on current events. The Dreyfus affair was highly divisive in France, with some (the “Dreyfusards”) seeing it as a gross miscarriage of justice, and others seeing Dreyfus as a criminal and a traitor, and quite possibly a representative of a Satanic Jewish conspiracy against France and French people. Méliès took a strong pro-Dreyfus stance in this series, and also showed that movies could be made that depicted political arguments persuasively. So far as I recall, he never made such a controversial movie again, nor one that so clearly made an argument for justice. At the time these movies came out, the Dreyfus affair was still ongoing, and any audience (even foreign ones) knew how to read the events as they happened. Today, we have less familiarity with this story, and it makes matters worse that two of the eleven films are not included. 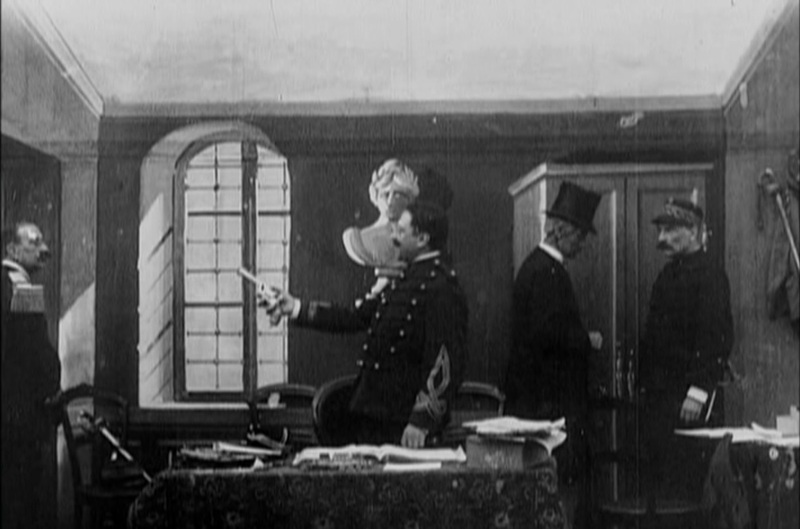 One comes between the original arrest and the scene at Devil’s Island, and depicts Dreyfus being stripped of military honors before being taken to prison. 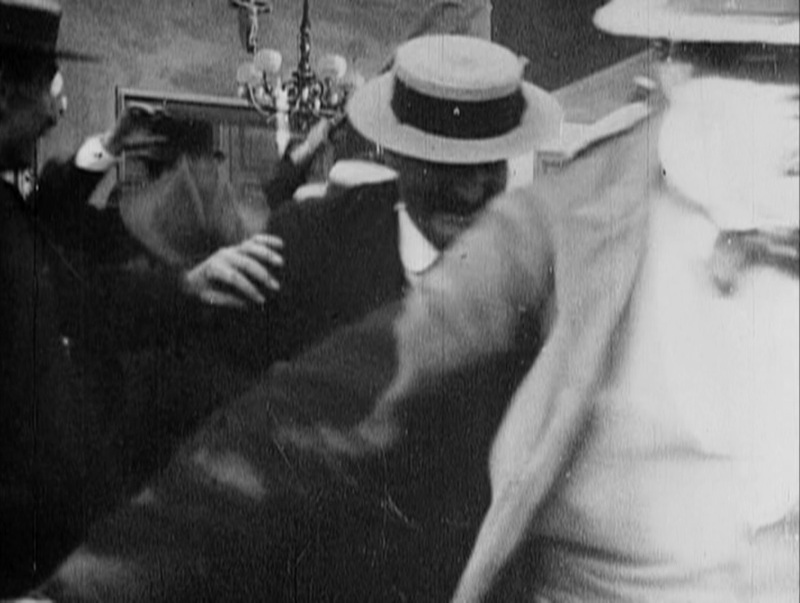 The second missing film is the last one, in which Dreyfus is led out of court to return to jail, where he would remain despite the evidence until 1906. The colonel who kills himself in movie #4 is one of those who created false evidence against Dreyfus, and the fight in court was between reporters from opposing sides on the pro-Dreyfus anti-Dreyfus fault line. 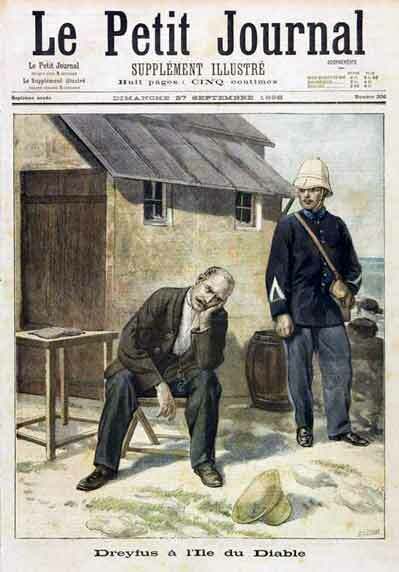 It’s worth noting that between that original arrest and the Court Martial at the end, Dreyfus was held in Devil’s Island for nearly five years after an initial inquiry. In general, though, even without these kinds of details, it’s possible for a modern audience to get the gist of this story. Like so many court room movies it is not so much about justice, but about injustice being carried out at the highest level. 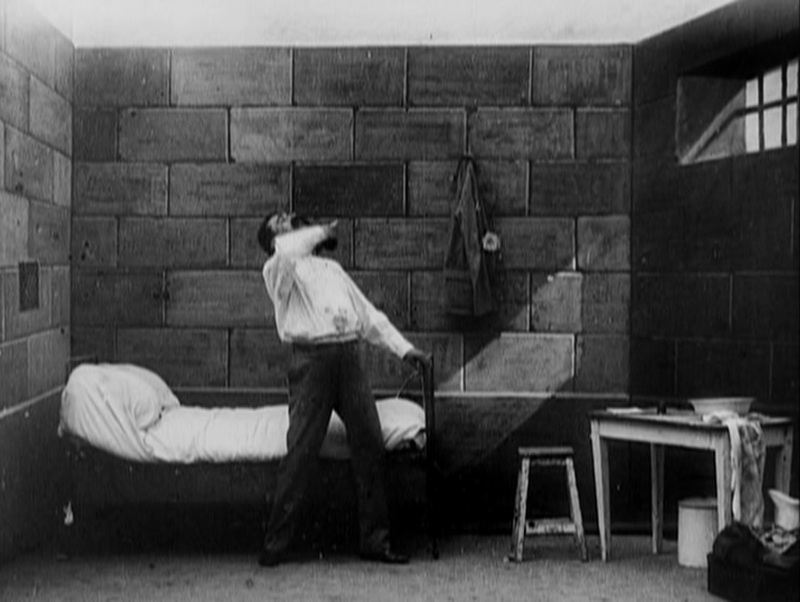 At the time Méliès made it, he had no way of knowing if Dreyfus might die in jail or whether his name would ever be cleared. He risked incurring the wrath of anti-Semites and others who regarded Dreyfus as de facto guilty, and even possible repercussions from official military or government channels. He also had the vision to find a way to tell a complex story using the still very new medium of film, and risked that this experiment might not work out. As it was, many Europeans allegedly believed they were seeing actual footage of the trial, rather than a re-creation, and of course within a few years, longer pictures with stories constructed by editing would be the norm. Méliès’s experiment paid off at least in the sense of giving a view of what was to come. This has been my contribution to the “Order in the Court” blogathon, hosted by Cinemaven’s Essays from the Couch and Second Sight Cinema! Please check out the other great entries as well. Starring: Georges Méliès, unknown others. Fascinating stuff. Most of what I know about Melies comes from the book “The invention of Hugo Cabret,” and the Scorsese picture HUGO that was based on it. So I have mostly seen images and clips from his more fantastical films. I didn’t know that he had even made films in the “ripped from the headlines” category! He’s far less known for this sort of thing, and some of his “docu-dramas” do have a fantasy element (eg: “Divers at Work on the Wreck of the Maine” https://en.wikipedia.org/wiki/Divers_at_Work_on_the_Wreck_of_the_%22Maine%22). This time, he played it straight. Thanks for reading and commenting! I can’t believe this was made in 1899! The sets, the quality of film making – especially that scene where the reporters fight! (Plus, I love the scene where he’s reunited with his wife and is overcome with emotion.) I would not have guessed this film/series of films was made before 1905-ish. That Méliès was truly amazing. To make such a timely, political statement, and to have a story arc that stretches over a series of films is sheer brilliance. I am so glad you shared this with us. Back when I started this project, I watched a bunch of Melies, much of which I still haven’t gotten around to reviewing. This series really stood out, because it’s so different from what we expect from him, and I’ve been meaning to write it up for a long time now. Thanks for reading! Thanks for hosting! Glad your *verdict* on my entry was good! Melies truly took his medium to new heights. How brave, and what a wonderful document for posterity.